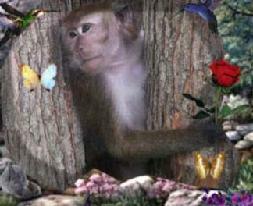 "All creatures possess an immortal soul. They just come in different shapes..."
it was because I loved you so. no earthly ties that bind. you've left them all behind. and gained a broken heart. I feel you by my side. through all the nights I've cried. 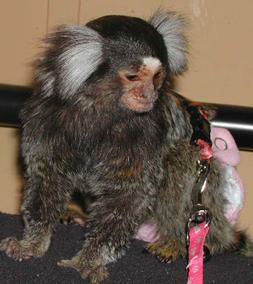 Riley was a happy and mischievous marmoset monkey-boy that brought joy and laughter to his human family. Riley loved being the center of attention and very much enjoyed his status as "Little Chief" He was independent and full of life. Although his life was short, he was here with us long enough to fill our hearts with forever memories. Mommy and Aunt Aimee love you so very much. When the tears have dried, you will be remembered and make us smile... you always did make Mommy and Aunt Aimee smile. Sleep peacefully, little boy. 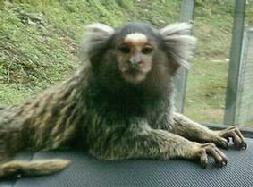 Precious little Midas was rescued by Mommy Julie last year. However horrific his conditions and how negative his only experiences of humans may have been, he somehow knew that for the first time in his short life he was truly loved. He blossomed and grew under the watchful care of "mommy" and soon learned the joys of treats and snuggles and playing in open spaces. His daily calls and happy chirps were proof to all that knew him how wonderful his life had finally become. Following a sudden illness, Midas crossed to rainbow bridge and is now waiting for the day that he and mom can be together again. Mommy has a broken heart but Midas can tell her that she was his gift... that she was sent to him so that he would know what it felt like to be truly loved. However short our time is here on earth, to know we were loved is the biggest blessing we can receive. Rest peacefully little one. Not a day will pass that you aren't remembered. You will forever be a little angel riding on mommy's shoulder and walking in the sunlight. and I would be whole. 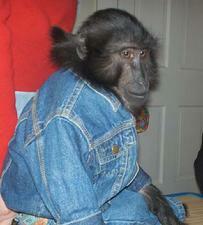 Koko, beloved monkey son to mommy Gayle passed following a brief illness. He leaves behind 27 years of memories...All the joy and laughter. the love and loss of a long life, lived knowing that he was truly cherished. 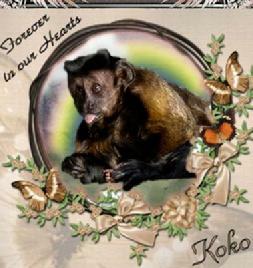 Koko brought smiles and happiness to his family and comfort to his monkey companions. He is missed by everyone whose life he touched and he will never be forgotten. There is now an empty place in mommy Gayle's heart but one more furry angel in heaven... where he feels no pain, or sadness... where he can run and play once more in the sunshine He waits patiently, knowing he will be with mommy again and wishes for her not to be sad, but to remember the many wonderful years they shared and to celebrate the beautiful life he lived...and smile. He loved it when he made mommy smile. Goodbye, but just for now, sweet boy. to those from whom we had to part. It keeps dear ones forever near. Glory once again in your health. Run free amid the wildflowers. Sniff the tantalizing smells among the wooded tangles of the forest trees. Sleep in the warm sun and hear nature's song. follow the bright strand- forged of love which forever connects us. It leads to the garden of my soul where a warm welcome quietly awaits your coming.. Precious little Maya came to mommy Julie only a few short months ago when she was rescued from a life of pain and sadness. For the first time in her life, Maya knew love and kindness and joy and made her gratitude known every day. Her willingness to once again trust and her capacity to show love were remarkable given her circumstances. At last she knew the joy of companionship and the freedom to run and play. She loved sitting in the sun during the day and snuggling into bed at night with mommy. She passed quietly in her sleep, knowing at last what it felt like to be truly loved. I'm sure she would want mommy Julie to know that she was the answer to little Maya's prayers and that she waits at Rainbow Bridge so they can be together again. Goodbye little girl. You touched so many lives while you were here. in memory I live on. Andrew, mommy Cheri and daddy Wayne's darling boy lost his battle following a brief illness only one year ago. Andrew was a big, strong boy and stories of his gentleness and joyful spirit endear him to all who knew him. From taking showers with his daddy to playing childlike in the sun, the unconditional trust and affection that he showed to those who shared his life can't help but make you smile. Mom tells the story of singing "You are my Sunshine"to him his last night, and Dad holding him as he peacefully drifted away. Andrew's story is one of unconditional love shared and a happy life lived; and now as he impatiently waits to play with mom and dad again, he knows that not a day goes by that he isn't missed. Good bye, precious boy. There are no words to express how very much you were loved. You will forever be mommy's little "Sunshine"
My heart still aches with sadness. 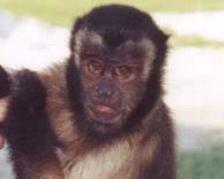 Max is the precious monkey son of Mommy Nickie and this is her personal dedication to him. Rest at peace sweet boy. You are truly loved. "Max came into my life on Mother's Day, May 12, 1990. We fell in love right from the start. 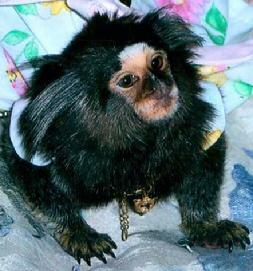 Max was the most sweetest little monkey who brought joy to all who knew him. He loved to travel and would squeal with delight whenever he saw the RV. We were constant companions and did not spend one night apart in all the years we were together. Max was healthy, happy and going about his daily routine on the morning of February 22, 2007. It was like any other day until my beloved Max died, without warning, suddenly and peacefully in my arms. I loved Max with all my heart and miss him so very much. He may be gone but he will live forever in my heart." each night in moon's glow? in every tree I pass. can hear you cooing in the grass. Precious Candilou Van, beloved fur daughter of Mommy Gayle will live forever in the hearts of those who knew her. Though time may lessen the unbearable pain of loss, the memory lives on and the love is with us always. Our time apart is only temporary. So, sleep peacefully...patiently for now dear, beautiful girl. Know that someday you will again feel the warm sunshine on your face and race joyfully into that wind. I promise that Mommy will be there waiting to meet you and you will laugh and play once more. Pretty Princess Isabella, loved fur baby of Mommy Gwen was taken much too soon. Her life, however short it may have been, was filled with love and pure joy of life that affected all her knew her. Isabella will be fondly remembered far beyond her presence here. All all of us who have lost a fur baby wishes for her mom to think of her and smile, remembering the laughter and love..all the while knowing that their time apart is only temporary. Good bye sweet girl. You will never be forgotten. "We who choose to surround ourselves with lives even more temporary than our own, live within a fragile circle, easily and often breached. Unable to accept its awful gaps, we still would live no other way. We cherish memory as the only certain immortality, never fully understanding the necessary pain." Joe Sephie is the cherished monkey son of mom, Nancy and his untimely passing leaves a void in the lives of his extended family and friends. Words cannot express how deeply he will be missed by those who knew him. He was full of joy and filled the lives of those around him with love and laughter. His gentle nature endeared him not only to his human companions but to the other furbabies that shared his life. Joe was one of the angels that we cannot keep, but only borrow for a brief time He was here long enough to teach the lesson he had to teach: The true meaning of unconditional love. In time, may the tears and sadness give way to the memories of all the times he made those who knew him smile....I understand from those who knew him best... that's what he would have wanted. Good-bye Joe Sephie...sleep peacefully, sweet boy. 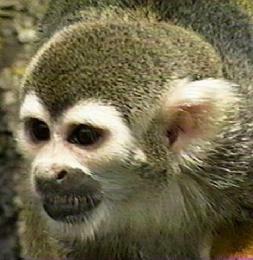 Lil' Joe is the much loved monkey son of mom Polly Custis. 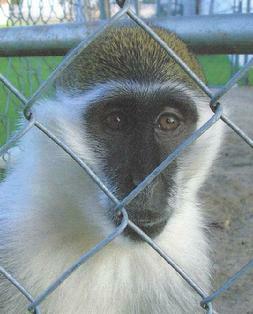 Sadly this precious, loving friend and companion lost his battle with spinal meningitis on November 13th, 2008. From all of us who have lost one of these beloved companions, our thoughts and prayers go out to Polly and her extended family. We know how much Joe was loved and how desperately he will be missed, not only by his mom, Polly, but by his brothers, Skipper and Louie, and his "person" sister Chloe. Lil' Joe leaves behind a fond memory to all those who were blessed to call him their friend. The important thing is.... Lil' Joe knew how very much he was loved. Good bye sweet Lil' Joe...you will never be forgotten. and the face you see in the moon is mine. talk to me through the Lord above you.